Captains: Adult League play-offs start Mach 18th! Current Standings: Gold League (A), Silver League (B+), Bronze (B-), Emerald League (C)! A Player Skate Rate has been scheduled for March 7th! Click here for more information! Season opened October 19, 2018 and runs through March 2019! Please register below for the 2019-2020 Season! The Palouse Ice Rink offers the fun and excitement of hockey for adult players who are experienced, as well as those who are new to the sport. Four levels of competition are available (see below). We are in the process of taking registrations and forming teams for the 2019-2020 Season, Space is limited, so complete and submit your registration now! For adult league questions, please email adulthockey@palouseicerink.com. Gold League Populated by advanced, experienced, competitive skaters. Usually players who have played hockey growing up, and continued on to higher levels of College or beyond. Silver League Populated by upper Intermediate players. Those who have a high level of basic hockey skills. He/ She has a very high understanding of team play and where they should be positional on the ice. Forward and backward skating is strong with good maneuverability and transition. They may have played high school varsity or adult league for quite some years. Bronze League Populated by lower to middle intermediate players that know the rules, can stop rather well, but may be less experienced adult recreational player. The player has limited understanding of where they should be on the ice, but understands basic game concepts. Forward and Backward skating may be somewhat strong but maneuverability and transitions still need work. This division fosters skill development and collegiality. Rosters are built deliberately for balance across the league, with the goal to create learning opportunities for all. Emerald League Populated by beginner or Novice skaters who may be new to the game and learning the rules. Also supporting experienced members of this league may have skated for 2 to 3 years but are still working on skating, stick handling fundamentals, or game Function of the league is to recruit new players into the league and develop them for the Bronze League. Ice time consists of both scheduled games and practice sessions. Novice League Practice sessions will involve skills and training, but some will be used for Open Hockey. Novice League Practice – Skills and Training: Bronze players may attend C League Practice skills and training sessions by paying a sub fee. Please email Novice League contacts so we can gauge numbers and inform you if we have reached our maximum for that session. 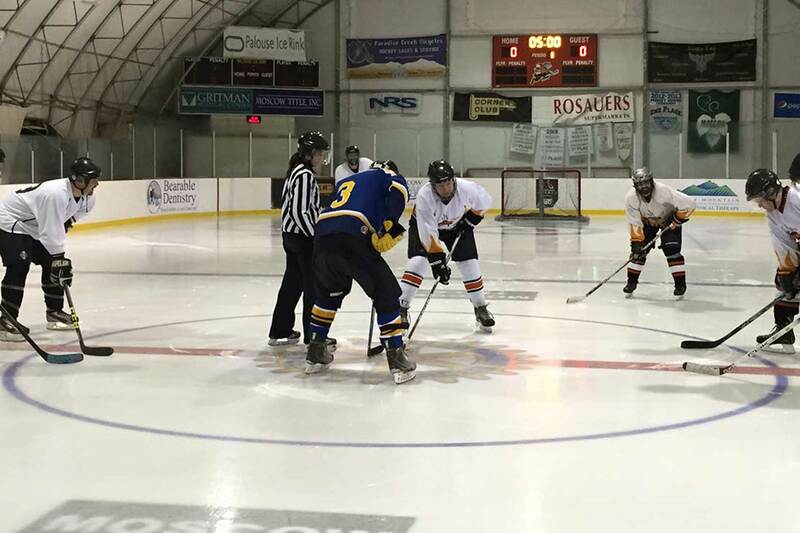 Novice League Practice – Open Hockey: A signup roster will be available for the Open Hockey times and initially only open to Novice League players. When they are not filled the day before the game, Bronze players will be able to sign up. Click here to sign up for practices! *NOTE: All Adult league games are non-checking and follow USA Hockey guideline and rules if not otherwise specified. We want players to work hard and realize collisions happen, but try your best to be safe, avoid reckless behavior and stay in-control of your play. One may sign-up as a team or as an individual. Team captains will work with other team captains, the Palouse Adult League Committee and Rink Manager to ensure a level of equality between teams. If a team appears to be over experienced and not comparable to other teams in the league they will be asked to resubmit an appropriate roster. The goal is to be able to play with those you wish, but also keep fairness, and appropriate competitiveness fun. Captains please mix up your roster and recruit players that will equal out as an average team in your division. Players signing up as in individual are encourage to try to find an appropriate team first. They may attend a rate skate on March 7th to be evaluated and to allow captains to recruit them. “Free agent players” may reach out to specific captains to find a team. If there are no teams with openings, than a misfit team of “free agents” will be created. If there is not enough space available to add an additional team in the league or on a team. The free agent players will be placed on a waiting list until a spot becomes available. Teams who do not pay as a team will be subject to having additional players add to their rosters at the discretion of the league director. Individual players…Please mail, email or drop off your registrations at the ice rink. I will have a box by the office marked “Adult Hockey”. Gold League subs click here! Silver League subs click here! Bronze League subs click here! Novice League subs click here! * The PIR PAL has been given permission to post contact names via individual registration forms. 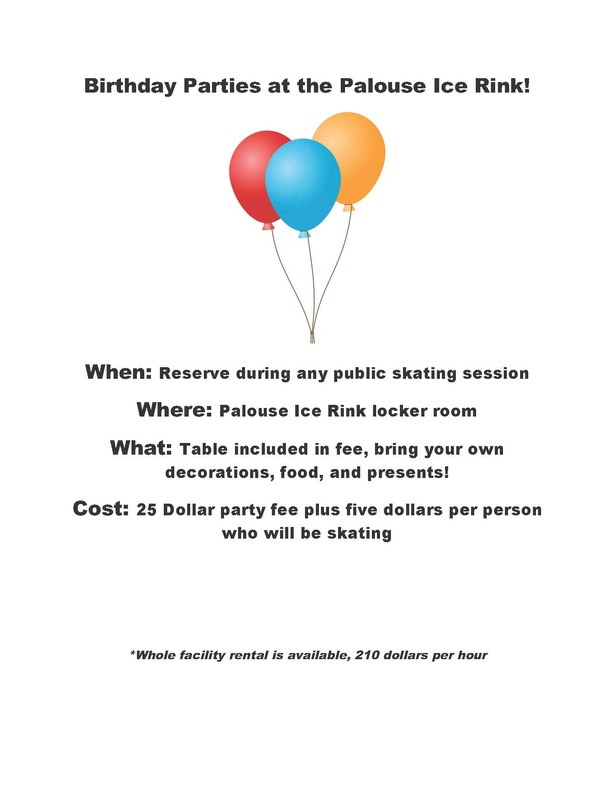 If you’d like to be removed from this listing please email: adulthockey@palouseicerink.com List not for redistribution. Below are links to 2018-2019 leagues schedule. Please take a look and check out the schedule. In order to fit all the games in (we are losing 3 Sundays to holidays) and not back load the schedule, we will have games on Fridays and Saturdays in addition to Sundays. Link to Sportibility click here!